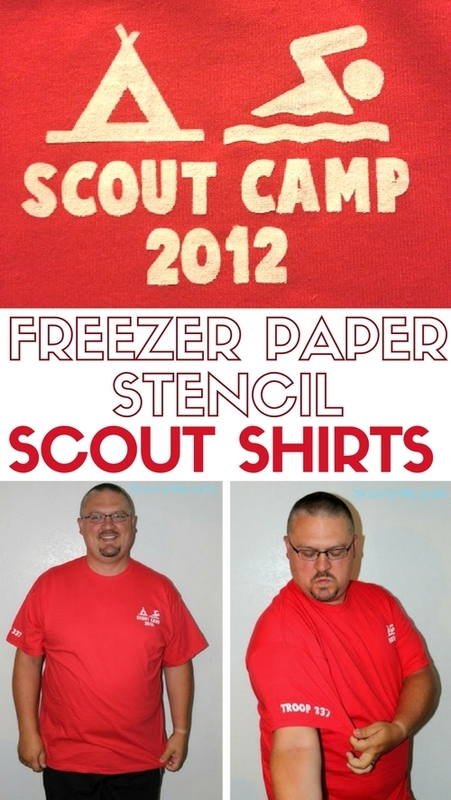 Save money for your scout troop, make your own Scout Shirts for Scout Camp with fabric paint and Freezer Paper Stencils. A simple DIY craft tutorial idea. A couple of weeks ago, my dear sweet husband, Paul came up to me in the middle of church. He asked if I would be able to make some scout shirts for their scout camp they had coming up that weekend. Being the nice and wonderful wife that I am, I said yes but that he had to help! He wanted something simple with the image on the right chest. I came up with a simple design using images from camping signs and a block font. Supplies Used:Some affiliate links are to similar items when exact items couldn’t be found online. Using Freezer Paper as a Stencil is super easy to do, so don’t let it intimidate you. Create your design and cut the freezer paper with Silhouette and reverse the design before cutting. Make sure the shiny side of the freezer paper is faced up on the cutting mat. Apply the freezer paper stencil to the shirt by placing the shiny side down and iron into place. Then paint over the stencil with the fabric paint. I made a total of 7 shirts. Two for the leaders and then 5 for the scouts. Here are all the shirts drying. Let the shirts dry for 24 hours and then carefully peel off the freezer paper stencil. I had to do this process twice because we painted in two places, on the front right chest and the left sleeve. Paul was very pleased with how the shirts turned out. I asked my husband to model them for me so I could take some pictures. He was not very excited, but I think he had been waiting for the opportunity for his inner model to come out! Isn’t he handsome! The shirts were a success! Everyone liked their scout shirts, or at least that I what I am telling myself. In the least, no one complained, and that is what’s really important. Have you ever made anything with a freezer paper stencil? What was it? Share and leave a comment below. Where are you going on vacation? Share and leave a comment below! 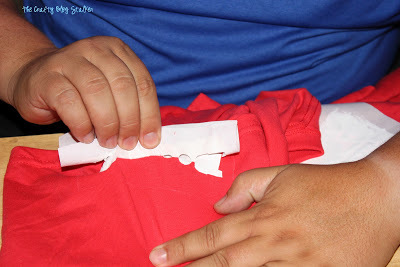 SAVE HOW TO MAKE A FREEZER PAPER STENCIL FOR SCOUT SHIRTS TO YOUR FAVORITE DIY PINTEREST BOARD! These are amazing. Thank you for sharing the how-to. 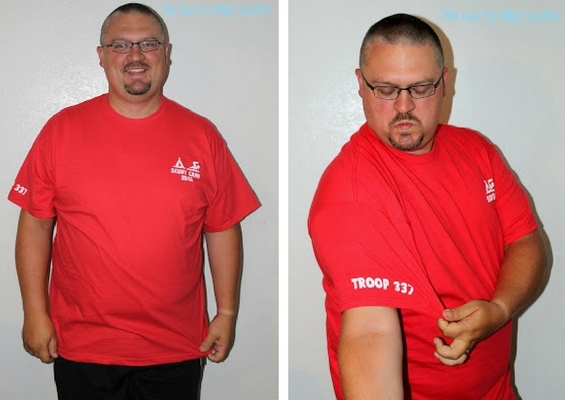 I am so pinning this for later:) The troop # on the sleeve- brilliant! Following on Pinterest now too! this is INGENIUS! my mind is buzzing with ideas for designs for my own shirts! thanks for linking up at the Happy Hello! Katie, I am an Assistant Scoutmaster, and can’t tell you enough how wonderful it is that you did this for the Troop! We’ve had to order summer camp Class B shirts and the price is definitely a factor for some of our families. I’ve also wanted to play with freezer paper but wasn’t completely clear on what the heck to do with it! Sheer genius! Can you wash them all like any normal shirts? Yup you sure can. The first time you wash it, it is suggested to turn it inside out. But overall you can wash it no problem. I know nothing about the silhouette machine, so I don’t know how things work. Were the images something that were on a cartridge or did you have to purchase special images from a store for it. Could this be re-done with a cricut do you think? The images that I used came from images I found on Google and then used the trace function in the silhouette software which then turns it into a cutable file. You could definitely use a cricut to cut the freezer paper but I don’t know if any similar images are found on their cartridges. I have to try this whole freezer paper thing. It looks so easy and awesome looking. thanks for sharing. Very nice! Thanks for sharing on “Show Off Friday” and “Perpetual Parades” Have a great weekend! Such a good wife! They turned out very nice, like they were printed! Thanks for sharing at Hookin On Hump Day! Holy cow. You are one great girl. I don’t know if I could churn out all of those t-shirts, especially such cute ones! Holy cow, pretty cool. You are a good wife and you hubs made me laugh. Thanks for sharing your creative inspiration with Sunday’s Best – you helped make the party a success! Such a great idea. Thanks so much for linking up to Tasty Thursdays on The Mandatory Mooch. I hope you will link up again. The party will be live tonight. I had no idea you could do this. man freezer paper is amazing. First, is your blade not sharp? Try cutting the same image out of a piece of cardstock and see if you have the same problem. Second, is your sticky sheet brand new? Sometimes I think these come too sticky. To lessen the sticky take a heavy piece of cardstock and put in on and off the sheet several times until you notice that it is lifting off easier. Third, make sure the wax paper is glossy side down. This side will stick a little less than the paper side. was wondering what type of paint you used? and did u have any trouble with the edges when you pulled the freezer paper up? Love the shirts! I have a cub scout and 3 girl scouts which I am a co-leader for so I am always looking for cheap ways to get them looking cohesive for events or camping trips. So thankful for all the info in advance. I used Soft Fabric Paint by Tulip -> here’s a link to it on Amazon. I didn’t have any problems with the edges. I would just make sure that they were ironed down nice and tight so the paint doesn’t sneak under them. When everything was dry, it pulled up great!